Hopefully it's as weird as ever. 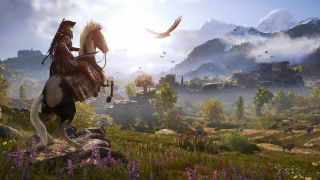 Ubisoft has confirmed it'll be returning to E3 in 2019, with its conference beginning on June 10th at 1PM PT. The publisher's conferences never disappoint for big game reveals—and since we don't have much of an idea of what Ubisoft has in the works past Anno 1800, Beyond Good & Evil 2 and Skull & Bones, there should be plenty of surprises. We know Assassin's Creed is skipping this year, so what can we expect? I predict Watch Dogs 3 will be announced, which is rumoured to be set in London (and, I imagine if that's true, minus any Brexit commentary whatsoever). I also wonder if this'll be the year we see Splinter Cell return, which was hinted by a series of Walmart Canada listings last year that were otherwise fairly accurate. I also think we'll see a completely new game, probably intended for next-gen consoles and PC, that'll be miles off but get everyone talking in the vein of the original Watch Dogs reveal. And, probably some Rabbids too. With Sony skipping E3 this year after the triumphant debut of this pipe guy in 2018, Ubisoft's commitment shows how important the event is to major publishers. We will be hosting the annual PC Gaming Show at E3 2019—you won't want to miss that.